Hi Everyone! This week I decided to use one of my background stamps, yay! The background stamp used is called "Wired Background" . "Party til the Cows come home" is from "Take the Cake" (an oldie but a goodie!) I also use viva decor pearl pens around the edge and some fun brown zebra ribbon. Now, don't be afraid to use your background stamps. 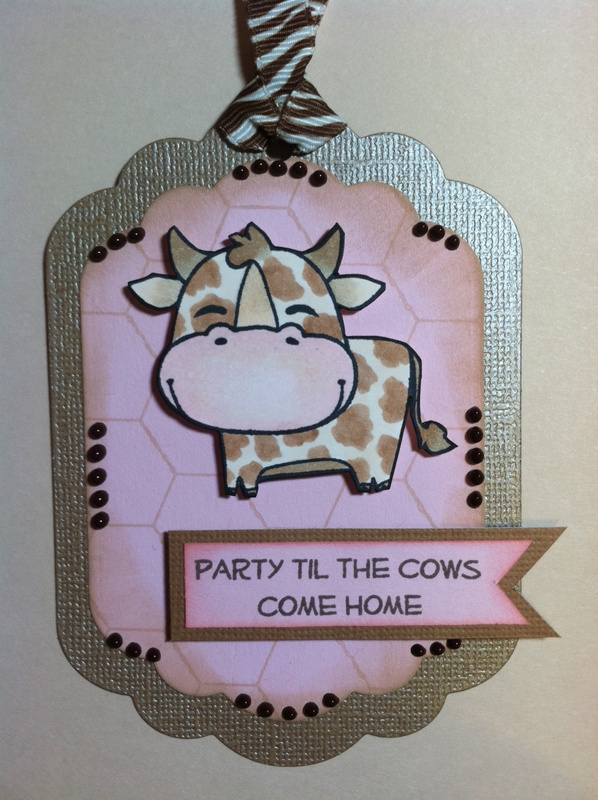 With my tag here I knew I wanted a light pink background behind the cow so I decided to ink my stamp in a light brown. I love how it just barely has a design. It doesn't over power the cow but at the same time its nice to have something other than plain cardstock behind it. So now I want to see everyone start using their background stamps in lighter colors :) Ready set go! Happy Tuesday and welcome to the Girly Birthday Blog hop. If you arrived here from Michelle's blog then you are in the right place! If not and you would like to start at the begining please click here. For this blog hop there are some prizes from sponsors! First prize is a $15 gift certificate from Pink by Design. Second prize is a $20 gift certificate to EAD Designs. In order to qualify for prizes you must comment on a blogs. When I think girly I think hot pink and black! For some reason this color combo has really stuck with my lately. So of course I had to do something punk / girly! :) This is the card I came up with.. The skull is cut from Rock Princess. 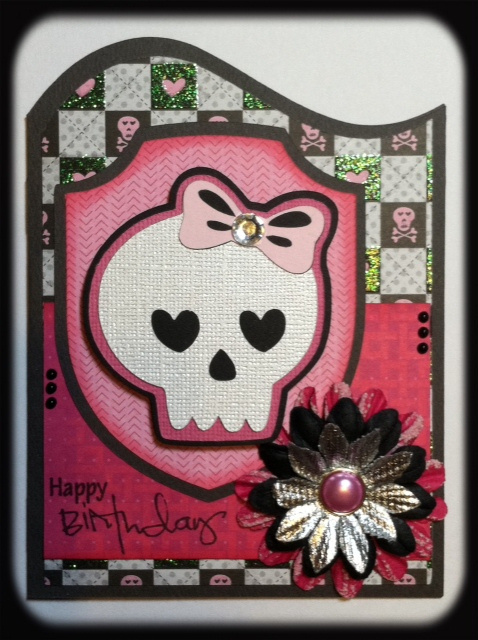 The card shape is cut from Birthday Bash and the sign the skull is on is cut from Campin Critters. 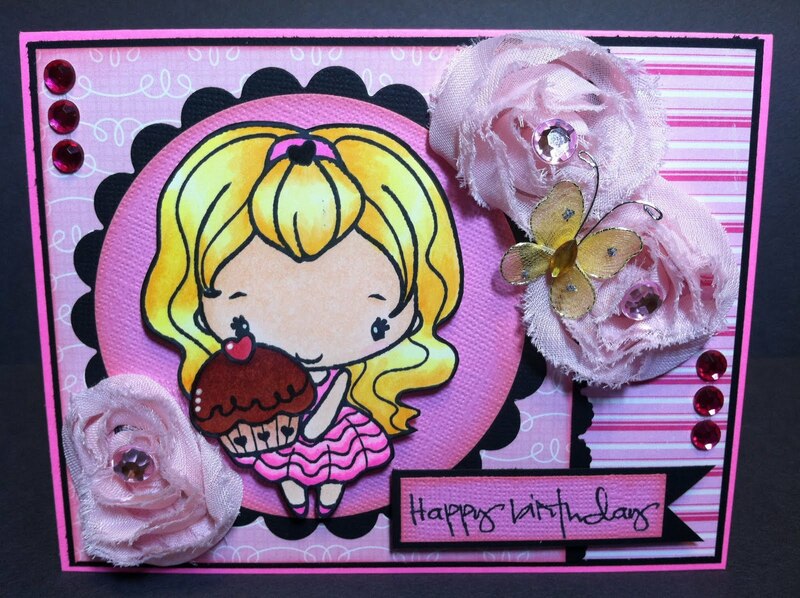 "Happy Birthday" is from Pink by Design "Scripted Year". So not sure if you all saw or not but I won a Greeting Farm challenge!! Yay!! For winning I get this awesome blogger button and I got a free stamp. I choose Birthday Anya 2. Here is my first card with her. Hi Everyone! I have a sneak peek to share with you for the upcoming Ustream stamp release on Friday! I recently got some oval punches and I love them!! I've decided to get a little creative with the way I use the punch and not use the entire punch. Here is an easy way to change the look of your punches.. Step 1: Stamp your sentiment as close as possible to an edge. Step 2: Punch it out using your punch like below.. Step 3: Glue what you just punched out to the paper you want for the next layer in your punch. Step 4: Punch out the next layer the same way you did with the first layer. By gluing the first piece down you can center it perfectly.